Rachel Hartman's debut novel, Seraphina, did a lot of remarkable things, but perhaps its most remarkable trait was that it did them all at the same time. In a mere 360 pages, Seraphina built a world, complete with history, theology, and culture; introduced a lively, complicated heroine with multiple problems and issues in her hectic life; charted relationships between her and several dozen interesting, vivid secondary characters, many of whom had their own backstories and plot strands; solved several mysteries in a satisfying and coherent fashion; and developed a sweet, compelling love story with just enough bumps in the road to make us root fervently for its success. Hartman's seemingly effortless ability to juggle these various story elements without losing sight of her rollicking plot or numerous characters reminded me strongly of the early Harry Potter novels, but with the added benefit of an emphasis on issues of race and gender—the handling of which was compassionate and intelligent. Though it told a self-contained story, Seraphina left a lot of balls in the air for its heroine and her friends to deal with, and it is perhaps unsurprising that Shadow Scale, the novel tasked with catching all those balls, is a baggier, less elegant beast than its predecessor. Still, if Shadow Scale is not quite as good as Seraphina, it contains enough of the things that made Seraphina good to be more than worthwhile in its own right. So much happens in the world of Seraphina and Shadow Scale that to try to sum up their premise briefly would probably take a writer of Hartman's skills, but I'll give it my best shot. Dragons exist. They are capable of taking human form and, while in that form, of fathering or giving birth to dragon/human hybrids, known as ityasaari. These offspring—who can sometimes pass for human but often have various deformities—are reviled by both dragons and humans, facing persecution, abuse, and sometimes even execution. Seraphina, our heroine, is one such ityasaari, though able to conceal the marks of her heritage with relative ease. Throughout her life, she has had visions of people who, as she discovered in the novel that bears her name, are others of her kind. At the end of that novel, the fragile peace between humans and dragons was nearly shattered. The Ardmagar Comonot, the dragon leader who brokered the peace for his side, was deposed in a coup by hard-liners objecting to the changes he'd wrought in dragon society. As Shadow Scale opens, Comonot has been granted sanctuary in Goredd, Seraphina's home country. Seraphina herself, whose heritage was revealed at the end of the previous novel, is dispatched on a mission to find and collect the other ityasaari, in the belief that their combined mental powers can be used to aid Comonot's mission and defend Goredd from dragon attacks. Seraphina was structured like a mystery, though in fact it comprised several of them—Seraphina's investigations into the life of her deceased dragon mother, her attempts to work out the meaning of her visions, and an actual investigation into the murder of a Goreddi prince, which eventually led to the discovery of the coup. Shadow Scale still contains these mystery elements—chiefly, when Seraphina learns more about Goreddi history, and about the strange, magical beings revered as saints who fought off the dragons centuries ago—but it is structured like a travelogue. Seraphina's journey to meet and gather together her fellow hybrids takes her to the Italianate nation of Nynis, to the Germanic Samsam, and to the island nation of Porphyry, whose culture has Middle Eastern inflections, before making her clandestine way back home through dragon territory. This constant movement between locations—and the ever-curious Seraphina's fascinated investigation into the nuances of culture and custom wherever she goes—are a major contributor to Shadow Scale's unwieldiness. But they also allow Hartman to show off just how good she is at worldbuilding. The cultures that Seraphina visits differ in languages and history, but also in a million telling details that leap off the page: music, artistic styles, food, folklore, superstitions. When Seraphina visits Nynis, she's dismayed at the richness of the local architecture, something that Goredd, which until relatively recently suffered frequent, destructive dragon attacks, hasn't had the chance to develop. But she's also surprised to discover that this wealthy capital has slums riddled with the plague, which is almost unheard of in her home country because of the dragon subspecies known as the quigutl, who have made their home in the Goreddi slums and like to feast on rats. As these examples show, Hartman has given a lot of thought to how the existence of dragons affects every aspect of human life, even in ways that the characters rarely consider. One of the worldbuilding aspects in both of these novels that I have found particularly refreshing is the importance of religion. Seraphina herself is not especially pious, though she's had religious training and is moved to investigate religion by her natural curiosity. But she's surrounded by examples of how religion and religious faith express themselves in different and sometimes contradictory ways. A deep, abiding faith is what underpins the kindness and decency of Prince Lucian Kiggs, the man Seraphina loves. It is also what justifies the cruelty of the Sons of St. Ogdo, a religious order violently opposed to peace with dragons, who view consorting with them, and of course hybrids like Seraphina, as punishable by death. When she travels to Porphyry, Seraphina is exposed to the religious traditions of that nation, which help to shape her worldview and guide her in developing her abilities, while also allowing her to learn more about the saints who have accompanied her throughout her life. Through all of this, Hartman crafts an elaborate tapestry of religious beliefs and traditions whose vivid, occasionally grotesque details have the ring of truth. There's never any question that religion has shaped the lives of everyone in the novel, whether or not they believe in it or have room for it in their lives. It's a nuance that fantasy novels often miss, or fail to depict in all its weird glory, but Hartman has captured it perfectly. The bittiness of the novel's plot, however, continues: another contributory factor is the very substance of Seraphina's quest, to gather together the far-flung ityasaari. This means that Shadow Scale inevitably takes on an episodic structure, as Seraphina encounters her targets one by one. But Hartman also takes advantage of this structure to slowly develop the themes of her story. Seraphina was a novel about one particular experience of passing. Shadow Scale is about an entire spectrum of them. Seraphina begins her quest both anxious and excited to meet her fellow hybrids. Having lived her whole life in a prison of her own construction—a prison which she believed to be necessary for her survival—she's dismayed to be suddenly so exposed, but also eager to meet others of her kind, to finally have the community she's been denied all her life. Against Seraphina's dream of uniting the ityasaari and healing the loneliness and persecution they've endured, however, we have the warning she receives near the beginning of the novel: "do not make the mistake, Seraphina, of supposing that suffering ennobles anyone. Some [of the ityasaari] may be lovely, but most will be hurt beyond your skill to heal" (p. 42). Most of Shadow Scale is concerned with illustrating the truth of this statement. The first few hybrids that Seraphina encounters are damaged but still lovable—a gentle plague doctor who suffers from kleptomania; an ethereal hermit who constructs elaborate and occasionally deadly machinery; a half-witted giant who has been used for violence but lacks the capacity for it himself. Her first truly negative experience comes when she encounters the painter Od Fredericka, who is far more functional than the other hybrids Seraphina has met, but who has grown so embittered by loneliness that she responds to Seraphina's friendly overtures with a cynicism that makes them seem childish and self-absorbed. I continued hastily. "That's why I'm gathering our kind together, officially. But I also know that we have each felt alone, even rejected. I hope we might be family to each other, supporting—"
All of these encounters, however, serve only as an overture to Seraphina's true challenge and opponent in the novel, Jannoula. One of the biggest guns on the mantelpiece in Seraphina, Jannoula was an ityasaari who contacted Seraphina as a child and nearly took over her mind. 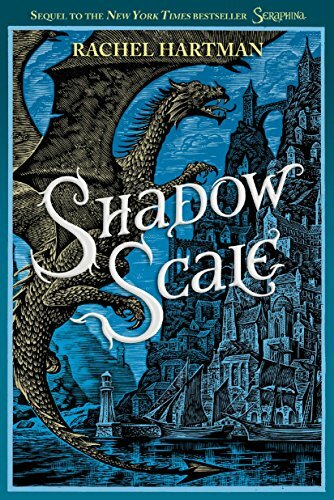 Shadow Scale gives us a more complete narrative of this experience, bringing home both the loneliness of the young Seraphina that made her vulnerable to Jannoula's predation, and Jannoula's own terrible history of imprisonment and torture. In the second half of the novel, Jannoula turns out to be on a similar quest to Seraphina's, and to be much better at it. Using her own mental powers, she bends the ityasaari to her will and is also able to influence the minds of humans, building up to a master plan that may be disastrous to dragons and humans alike. The danger posed by Jannoula forces Seraphina to explore her own abilities, and in so doing to get to the bottom of the psychological damage she's suffered by living an isolated, secretive life. But though Jannoula is the novel's villain—and a highly hissable one at that, equally disgusting, pathetic, and terrifying—Hartman never loses sight of the ityasaari’s own suffering, and of the fact that she is a monster made by other monsters. In the final third of the novel, Seraphina's world expands even further when she travels into dragon territory and lives for a time among the quigutl. Maligned by both dragons and humans as semi-intelligent vermin, they turn out to have a rich if extremely alien culture, and their own deep-seated resentment towards the dragons. (The quigutl are also the source of some of the novel's more humorous moments, as when Seraphina introduces them to music: "The quigs chattered animatedly about the wavelengths of the notes, whether one could make such an instrument from a musk ox femur, and what sort of modifications would be required if one had no lips" [p. 410].) It's yet another fascinating reminder that there are more stories going on in Seraphina's world than she could possibly be aware of, but it's also a demonstration of how busy this novel is, and how the throughline of its plot can be lost in our (justified) fascination with Hartman's worldbuilding. If Shadow Scale's constant expansion of its world makes it episodic and unwieldy, however, it is also entirely true to the kind of story Hartman is trying to tell. Shadow Scale is a story about opening doors. It is about Seraphina learning that the world she lives in is so much greater and more complex than she ever imagined. It is about her learning to see the world through other people's eyes and to look past her assumptions: in Porphyry, Seraphina meets a woman named Camba, whom she once stopped from committing suicide; Seraphina assumes that the suicide attempt was linked to Camba's being a hybrid, or to the fact that she is a transwoman; in fact it turns out to be over a disastrous business decision. As Seraphina muses, "A single action could derive from many motivations. I should never assume" (p. 314). Most of all, Shadow Scale is about Seraphina learning her own mind and her own powers, embracing the connections that, as a child, frightened her and threatened her sense of self. If the world that is revealed by opening these doors is a little overwhelming, that's perhaps intentional, as this is exactly the effect it has on Seraphina herself. I can't quite believe I'm saying this, but Shadow Scale might have worked better if Hartman had split it into two books and stuck with the traditional but justly derided YA trilogy structure. It's to her credit that she didn't, as is the fact that though Shadow Scale leaves plenty of room for more stories about Seraphina and her friends, it also decisively ends its story and ties up all of its loose ends (one of the best of these is Hartman's solution to the love triangle between Seraphina, Lucian, and the teenaged queen to whom he has been engaged since childhood; she comes up with a twist that is surprising, true to the characters, and a little bit saucy). But the result is a novel that, though delightful in so many of the ways that Seraphina was, is not quite on its level. Still, that's a high bar to clear, and there is so much to enjoy in Shadow Scale that it is almost unkind to make the comparison. This is still one of the most vibrant, enjoyable fantasies I've read in some time, and marks Hartman out as an author to watch.